THE SINN FÉIN newspaper An Phoblacht is about to cease publication after 47 years. The publication has announced that the December 2017 edition will be the last print edition. The print edition will be replaced by an occasional magazine, with the first edition due out in March 2018. This will be accompanied by online articles. The move to digital was announced by Sinn Féin’s director of publicity Ciaran Quinn in his latest editorial for the publication. “Just as Sinn Féin is in a process of renewal and regeneration, so is An Phoblacht,” Quinn wrote. Quinn said that with this in mind, the party will be ending its monthly print edition and moving over to digital. Through the years, its editors included major party figures such as Patrick Little, Peadar O’Donnell and Frank Ryan. Amongst its contributors were Seán Lemass, Frank Gallagher and Hanna Sheehy-Skeffington. In his editorial, Quinn thanks all those who have helped the newspaper thrive throughout the years. We want to thank all those who have worked on the monthly edition, the contributors, photographers, production staff, sellers and – most importantly – you, the readers. We especially extend out thanks to outgoing editor John Hedges and designer Mark Dawson for their commitment and skills in producing the monthly paper and associated publications over the past seven years while introducing the maintaining our social media platforms. Email “It's an end of an era for Sinn Féin as An Phoblacht ceases publication”. 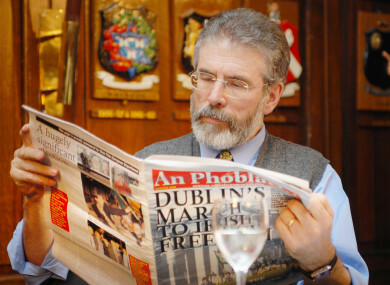 Feedback on “It's an end of an era for Sinn Féin as An Phoblacht ceases publication”.